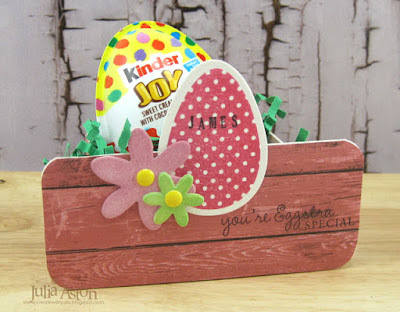 All this month Eileen Hull's Inspiration Team will be posting creations using Eileen's Sizzix Dies with a Spring Things theme. This was the perfect opportunity for me to make place card treat boxes for my grandnieces and grandnephews to have at their seats at the Easter Sunday table! I used Eileen's Stacking Drawer die and her Place Card and Flowers die. 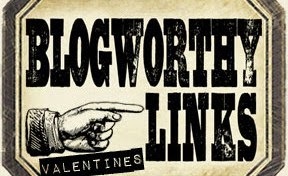 Here are a few photos showing how I put these together. 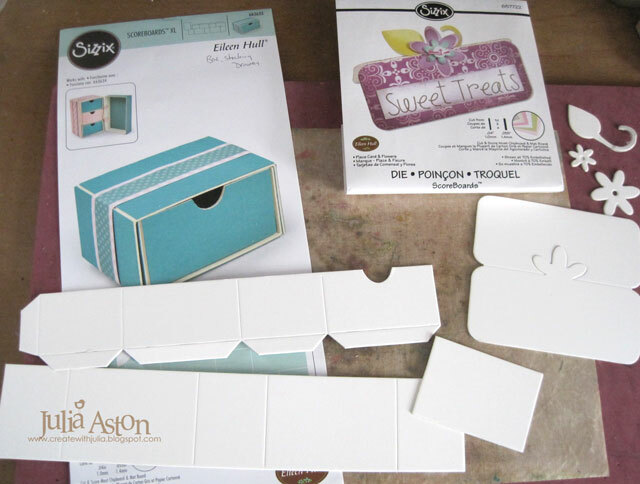 I cut out the pieces of each die from mat board. 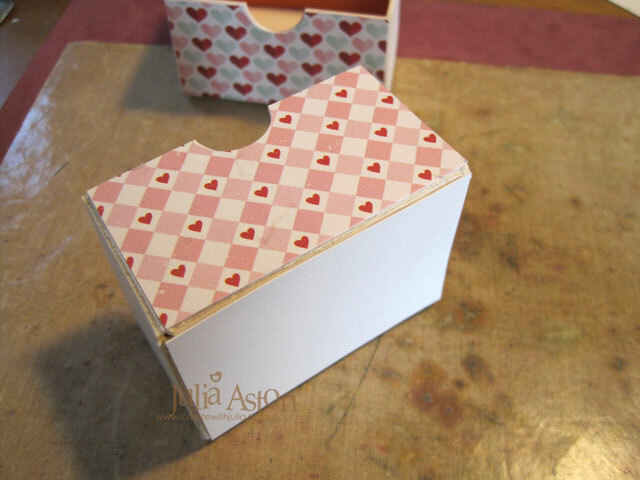 as I wanted an open box to put treats in. I cut apart the place card die-cut at the score line in the center so I could make two place cards from one die-cut (since I didn't need to have the place card stand up on its own) - the patterned paper and the egg cover up both the extended flower and the negative cut-out of the flower. 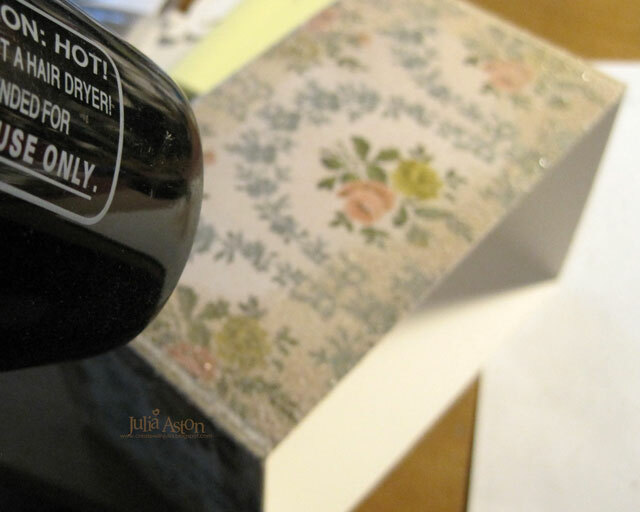 I die cut a piece of patterned paper - placing the paper just over the bottom half of the place card die - and adhered the paper to the mat board die cut. 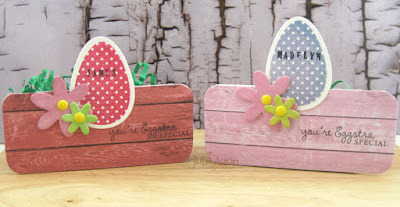 I stamped the dotted eggs on watercolor paper and die cut them with a Nestability Egg die. 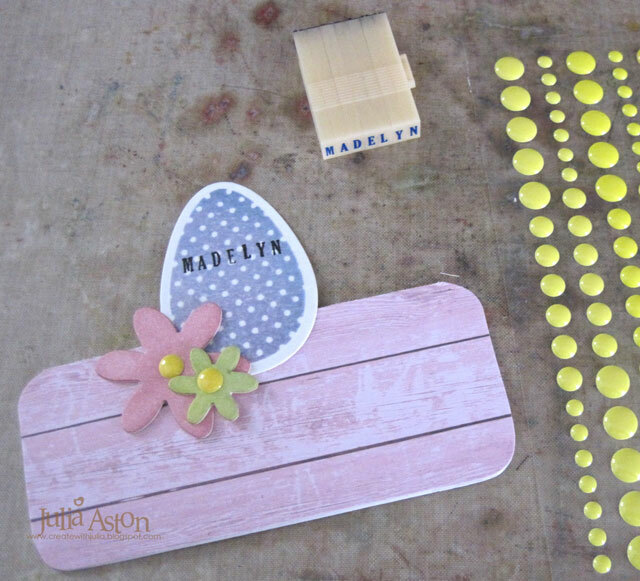 I sponged the flowers from the place card die in spring colors, stamped their name on the egg and added enamel dots to the centers of the flowers. I adhered the egg onto the place card piece and layered the flowers over the egg. 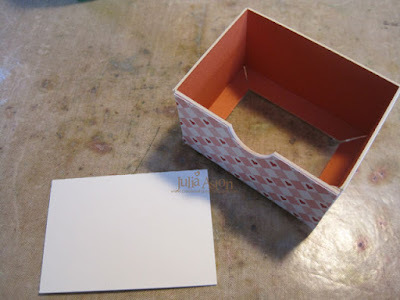 I cut pieces of patterned paper to fit 3 sides of the drawer (one 2 3/4" x 1 1/2" and two pieces 2" x 1 1/2"), leaving the notched side plain as it would be glued to the back of the place card piece. 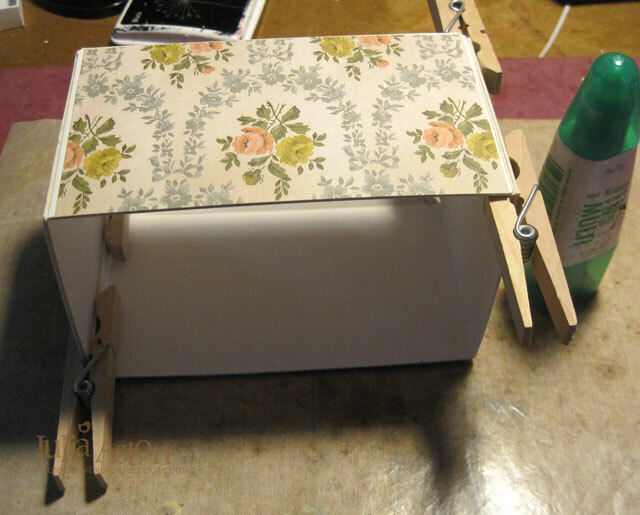 After gluing the sides together, I glued the bottom onto the drawer. 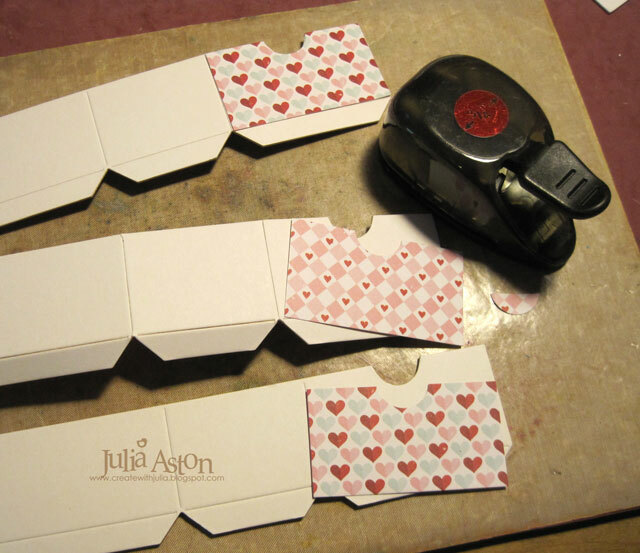 Then I glued the plain front of the drawer to the back of the place card. I added paper grass to each box. Here's the side view. and the view from the back. 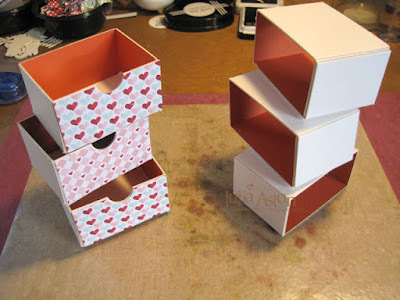 I placed a Kinder Joy egg in each box. They love to have things personalized with their names. 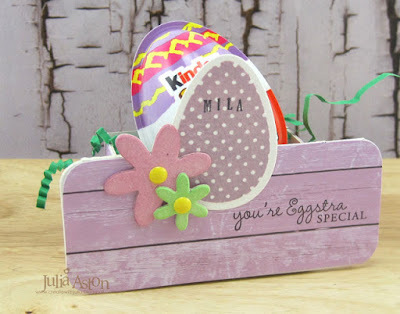 These will be a festive addition to the table at Easter Dinner! 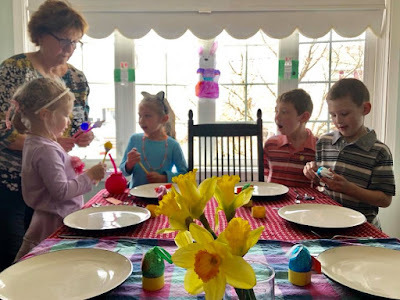 I'm already thinking about what I could put on them instead of an egg for other holidays! Here's a photo of me and the kids last Easter when I had brought Easter mazes I found on line and chick and bunny head pens that lit up like strobe lights when you tapped them on the table!! Madelyn, Mila, Landon and James. 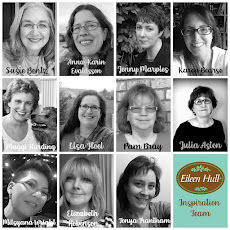 Please check out Eileen's blog during the month of March where you will see all of the Inspiration Teams Spring Things projects gathered! 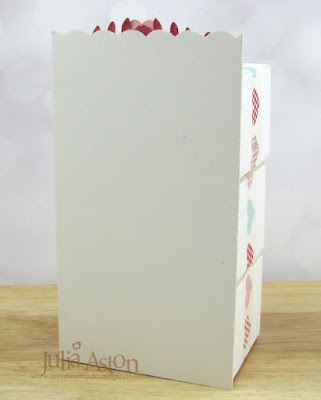 Paper: Little Sizzles Matboard - Sizzix, Wood Grain Paper Pad - Joann, watercolor paper - Canson. Ink: Limeade Ice, Lovely Lady, Vintage Jadeite, Lavender Moon, Hibiscus Burst, Spring Rain, True Black - PTI. 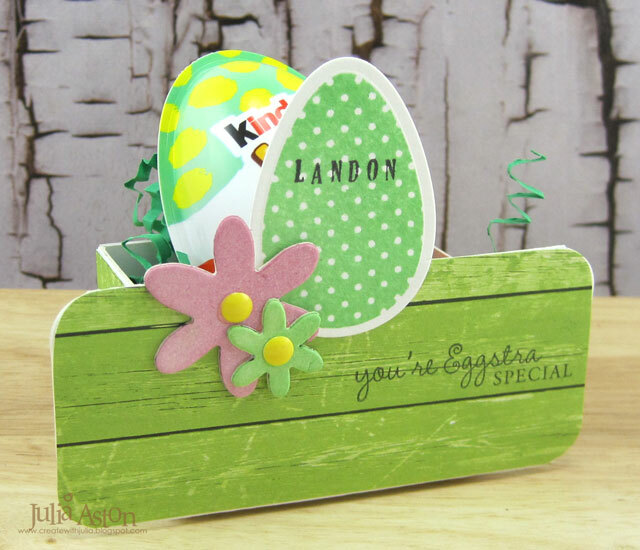 Accessories: Box Stacking Drawers die, Place Card and Flowers Die - Eileen Hull/Sizzix, Nested Eggs die - Nestabilities/Spellbinders, enamel dots - Altenew, Tombow Glue. 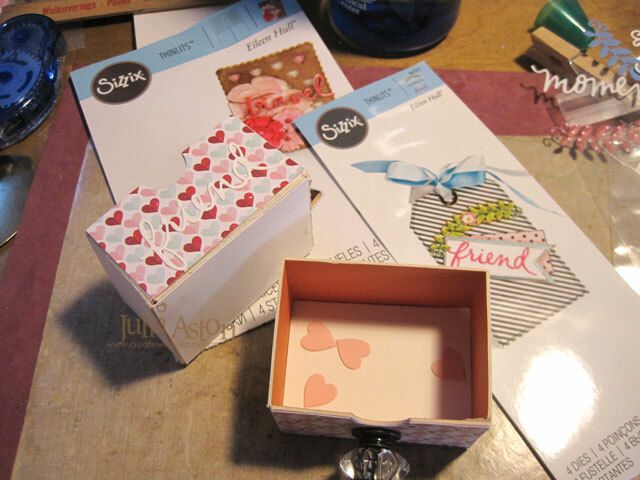 This month Eileen Hull's Inspiration Team is making hearts and flowers projects using her Sizzix Dies. 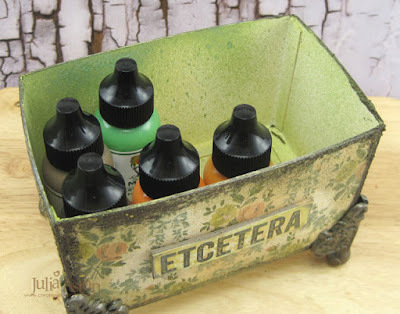 Today I'm sharing an open storage box that will use for craft storage in my craft room. 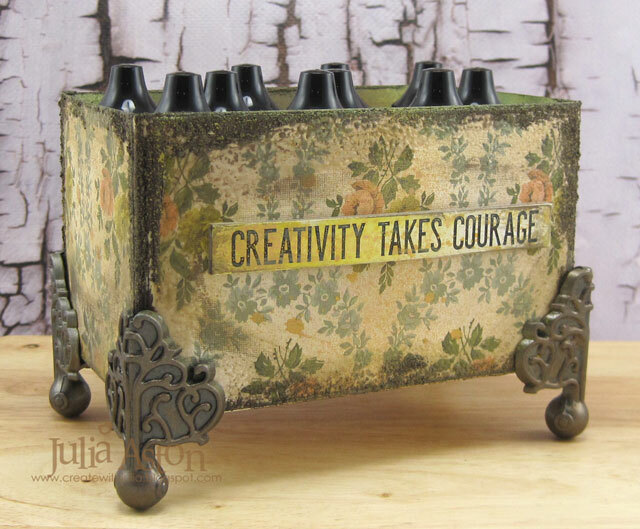 I love to have artistic storage on my shelves! It makes me happy just looking at it! 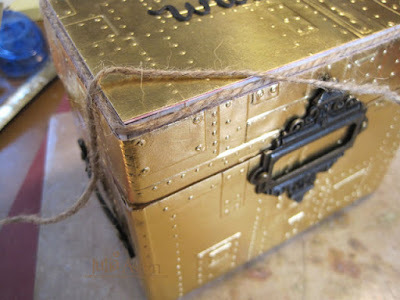 I used Eileen's new Treasure Box die but didn't use the hinges or the top of the box that is included with the die. 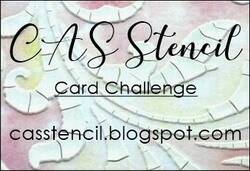 I have some photos to share showing how I put this all together! First I cut the pieces I needed out of Little Sizzles Mat Board. Then I measured the panels and cut pieces of Tim Holtz Worn Wallpaper to adhere to the sides. 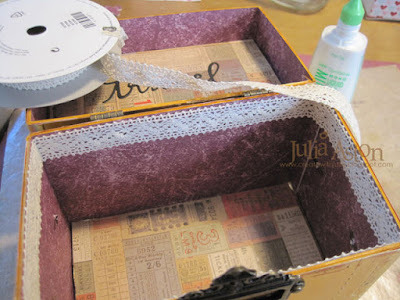 I glued the tabs on the sides with Tombow Glue and let it dry a few minutes being held with clothespins. 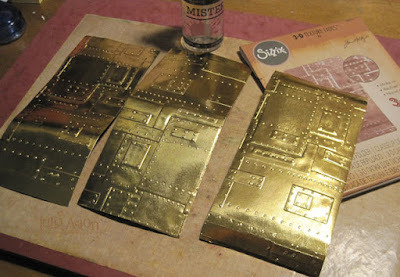 Then I adhered the bottom piece to the tabs. 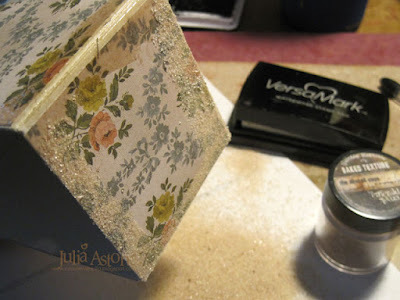 I wanted to age the look of the paper and so rubbed all the edges with Versamark Ink and poured on Vintage Beeswax Baked Texture - shaking off the excess and heating with my heat tool. I did one side at a time. Then I rubbed Brown Rust Effect Paste from Prima on all the outside edges with my finger and let it dry overnight. 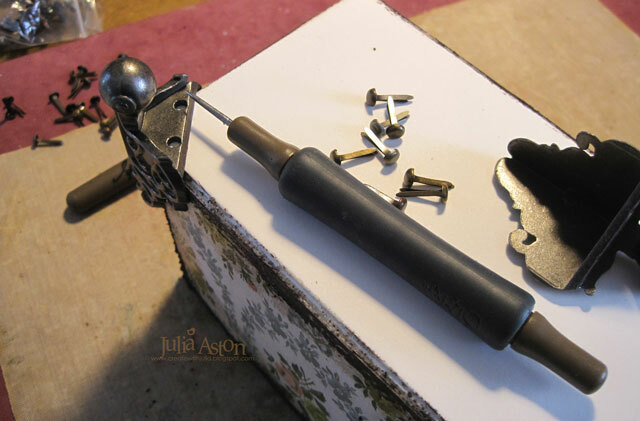 I added Idea-ology Clawfoot Corners with long brads to the bottom corners piercing the holes with a piercing tool. 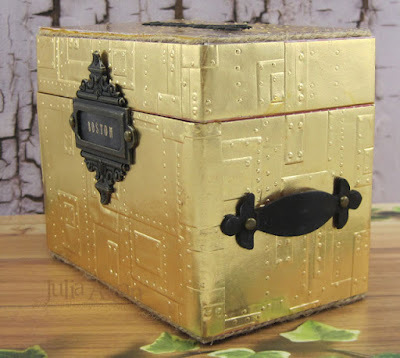 I sprayed the inside of the box with both Peeled Paint and Fossilized Amber Distress Oxide Sprays just so it wasn't stark white in there as I knew most of it would be covered with whatever I stored in there! (rather tentatively as I was afraid I'd cover all the flowers! 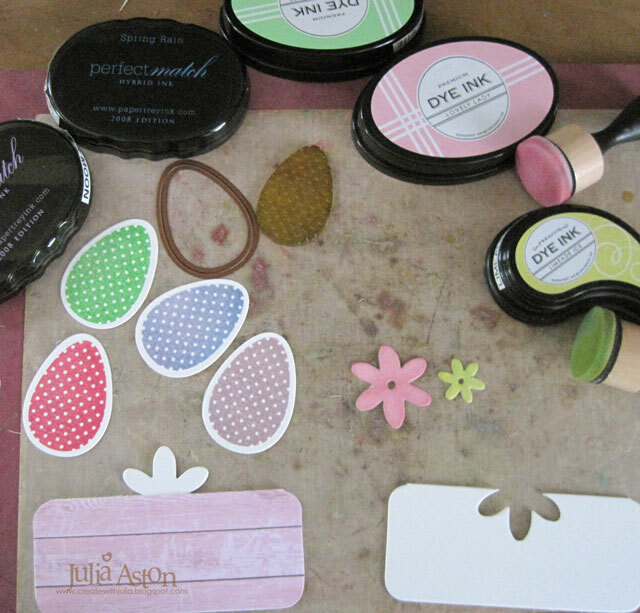 I also sprayed the Quote Chips then adhered them to the sides with Tombow Glue. I rubbed Prima Alchemy Bronze Age Metallic Wax over all the feet just to add another tone to the metal and I also rubbed just a little of the wax over the Quote Chip corners and some of the wallpaper. 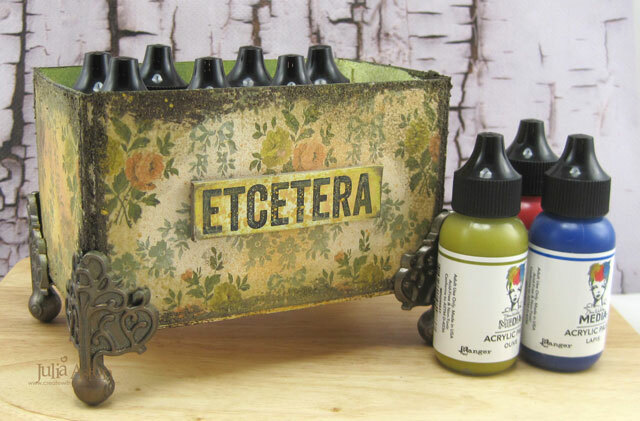 I was able to fit 10 small bottles of Acrylic Paint inside the box which measures 5" x 3" x 3" on the inside but I was also thinking it might be a good place to hold word dies? 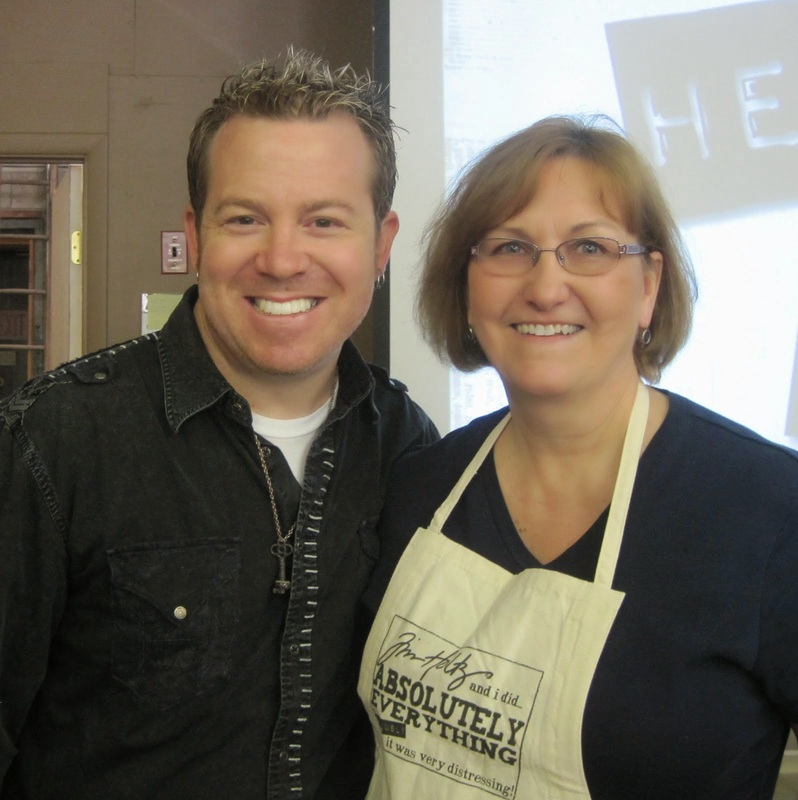 Please check out Eileen's Blog where all of the Inspiration Team's projects have been posted this month! 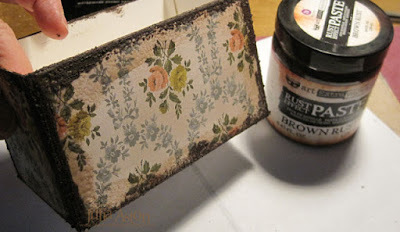 Paper: Little Sizzles Matboard - Sizzix, Worn Wallpaper - Idea-ology/Tim Holtz. 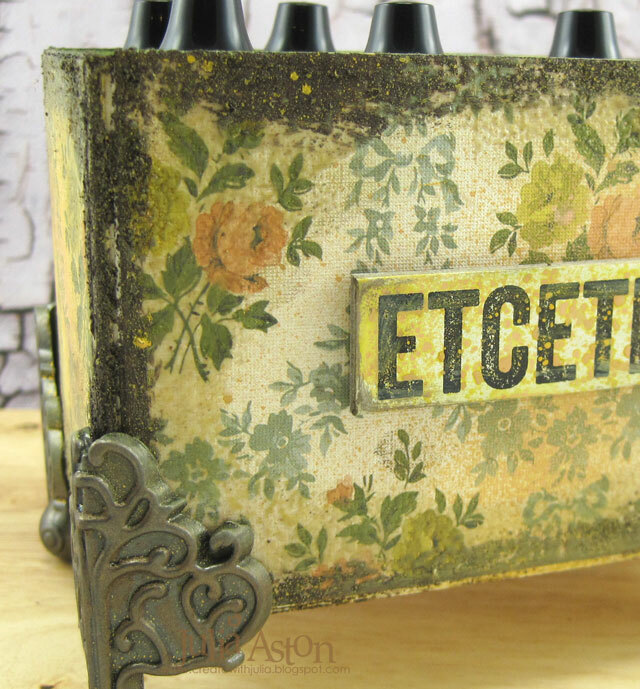 Accessories: Treasure Box Die - Eileen Hull/Sizzix, Vintage Beeswax Baked Texture - Emerald Creek, Rust Effect Paste Brown Rust - Prima/Finnabair, Ranger Distress Oxide Spray Peeled Paint and Fossilized Amber, Quote Chips, Foundations Clawfoot Corners, Long Fasteners - Idea-ology, Alchemy Metallic Wax Bronze Age - Prima, Piercing Tool - Sizzix. 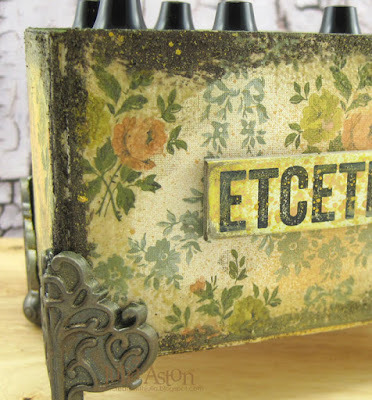 Today I'm sharing a project I made using Eileen's new Box Stacking Drawers Sizzix Die, just released this month at Creativation in Phoenix, AZ. 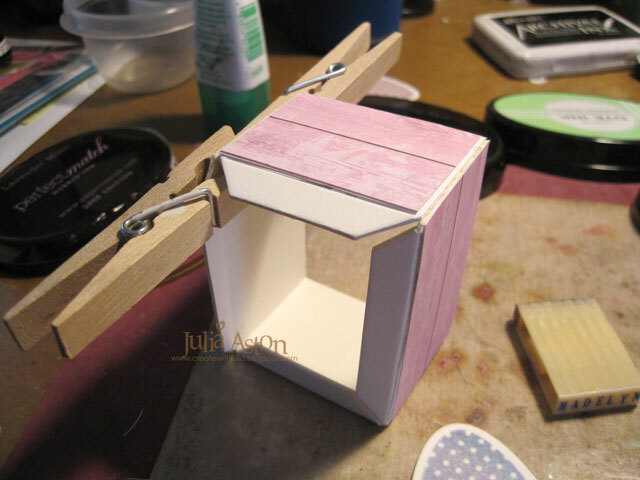 I added a matboard backing to hold the 3 drawers together - making it like little bureau! 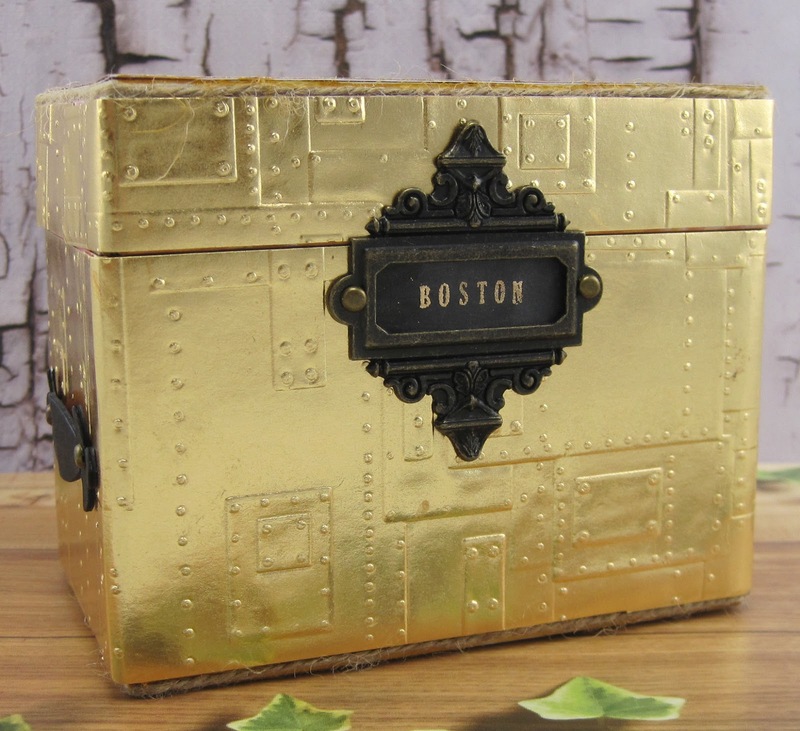 The perfect size to hold smaller craft ephemera or jewelry! Each box measures 3" x 2 1/8" x1 1/2"
The 3 boxes also fit quite nicely inside Eileen's new Treasure Box die! First I die cut all the pieces from matboard. 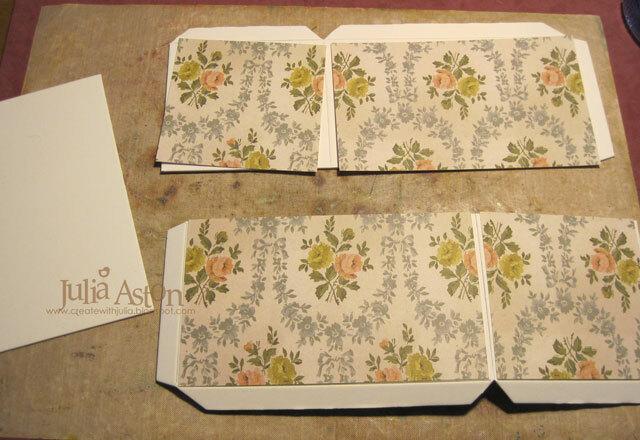 I cut pieces from Valentine patterned paper to cover the front panel. I found that I could punch out the curve with a 3/4" circle punch - it matched perfectly! 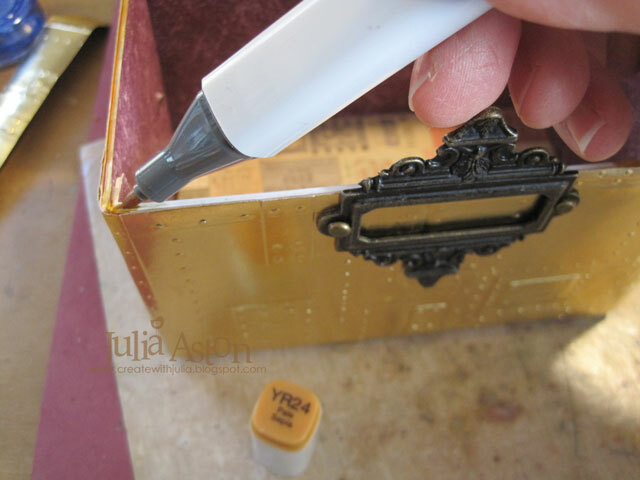 I adhered the paper to the matboard with Tombow Glue. I folded each drawer panel and assembled them. 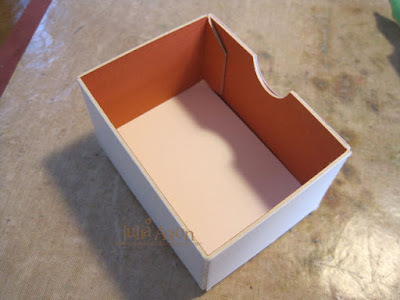 Normally on a box die you would probably attach the bottom panel on the outside of the drawer, but in order for the drawer to slide into the surround, Eileen instructed us to adhere it on the inside of the drawer if you are using the thicker matboard. Here is the matboard bottom adhered to the inside bottom of the drawer. 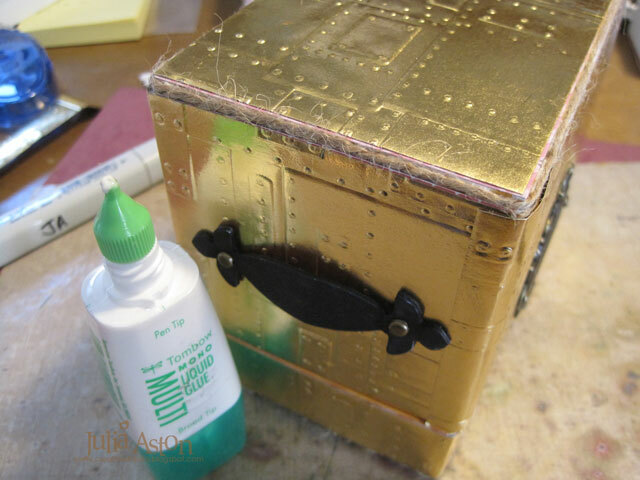 Since I had glue residue on the outside of the bottom (as confessed above!) 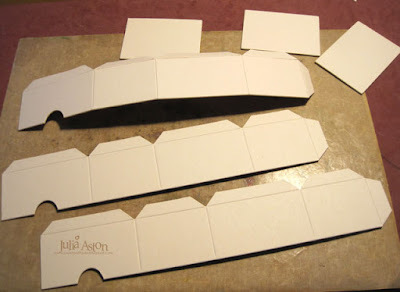 I adhered a thin panel of cardstock to the bottom to make it clean and neat. SO, finally we have the 3 drawers and the 3 surrounds assembled! I cut a 6" x 3 1/8" panel of matboard to create a backing for the stacked drawers. I die cut the scallop along the top with Eileen's Movers and Shapers Scallop Border Die. These stacked drawers also fit perfectly inside of Eileen's other new die - the Treasure Box but I used the stacked drawers separately in my design today. 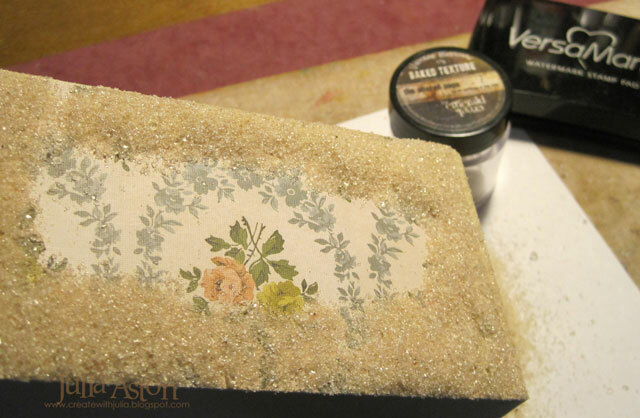 To adhere the surrounds to the backing - I ran glue along the back edges of the drawer surrounds and pressed them against the back panel. 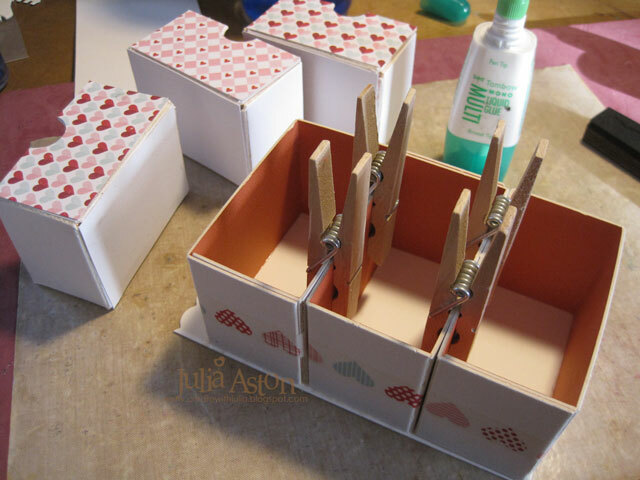 I also put glue on the top and bottom edges that touched each other and added clothespins to hold them tight while drying. 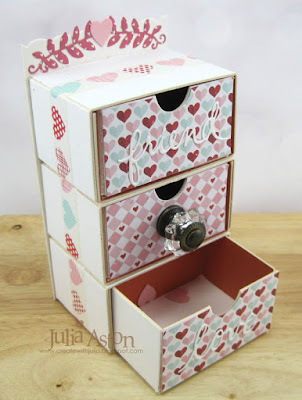 I dropped a few of the extra hearts into each drawer since I had a lot after cutting them with the Journaling Cards - Hearts die. 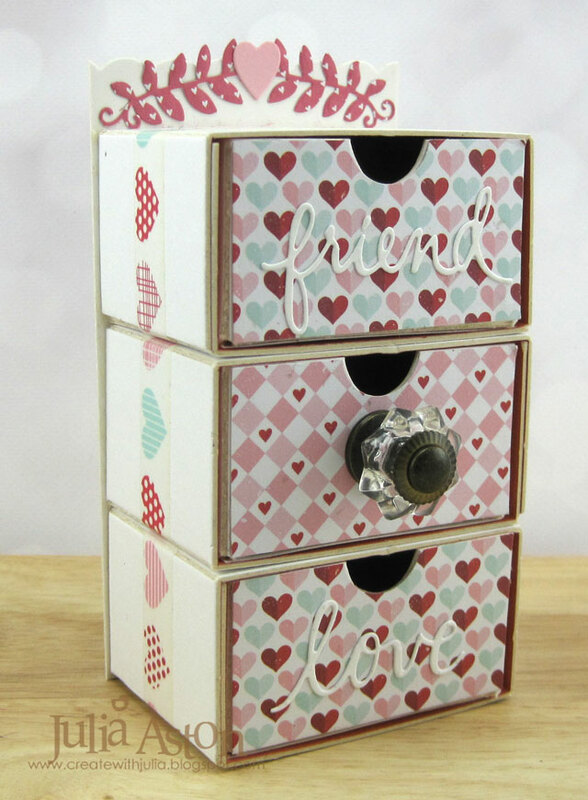 I wrapped a pretty hearts washi tape around each surround before attaching them to the back panel. 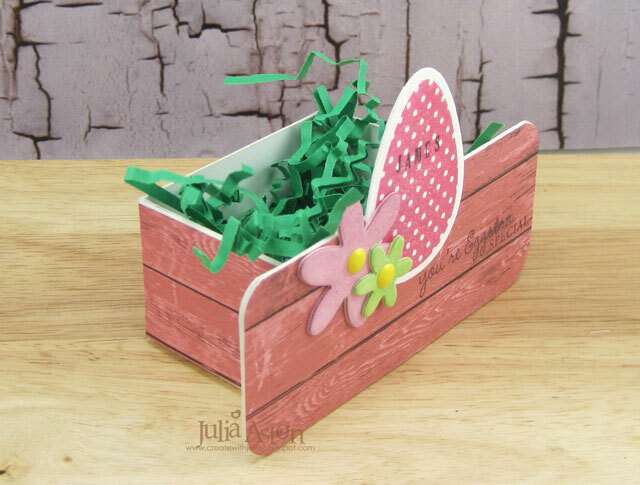 I added Eileen's Floral Arch to the top as well as a heart from Journaling Cards - Hearts. 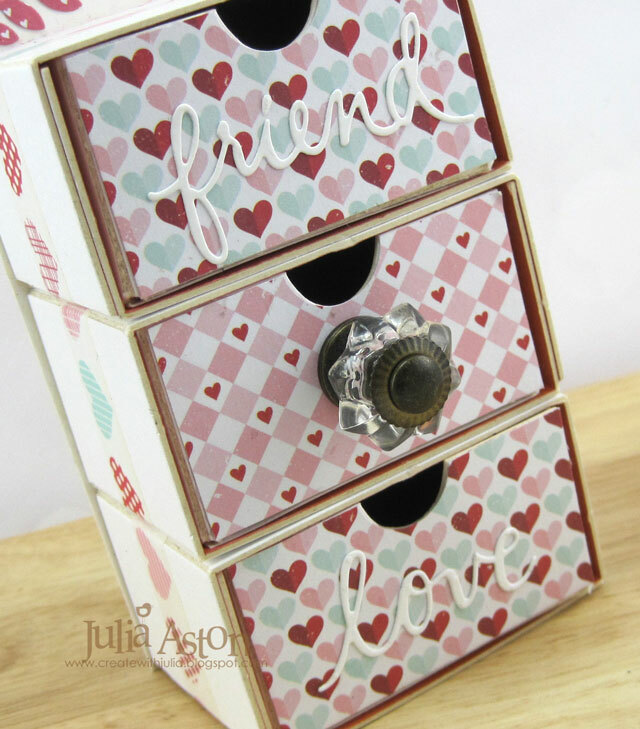 I added an Idea-ology Custom Knob to the middle drawer and die cut 'Friend' from Floral Arch and Words and "love" from Journaling Words to the top and bottom drawers. 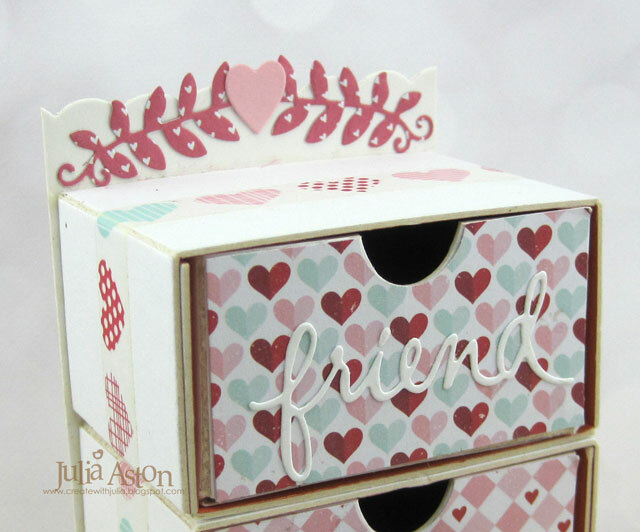 Close up of the 3 drawer fronts. I hope you have enjoyed seeing my little project using Eileen's new Box Stacking Drawers die. I know I had a lot of fun creating with it! 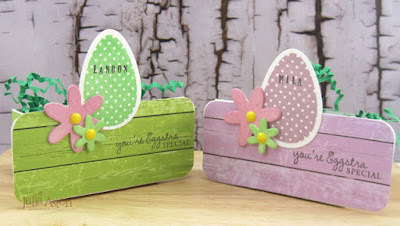 Please stop by Eileen's blog to see more wonderful projects by the Inspiration Team using her lovely new dies! Paper: Mat Board, Valentines Day Paperpad - Michaels, white and Pale Peony cardstock - Papertrey Ink. 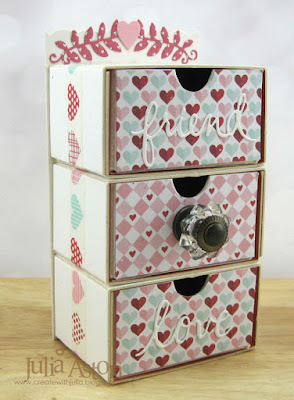 Accessories: Box Stacking Drawers, Movers and Shapers Scallop Border, Floral Arch and Words, Journaling Cards- Hearts - Eileen Hull/Sizzix, heart washi tape, Tombow Glue, Custom Knob - Idea-ology. Eileen Hull New Sizzix Treasure Box Die! 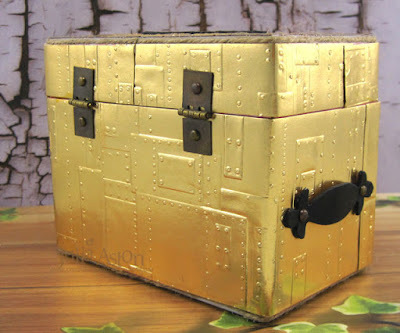 I'm excited to share with you today Eileen's new Sizzix Treasure Box Die just revealed at Creativation in Phoenix AZ! 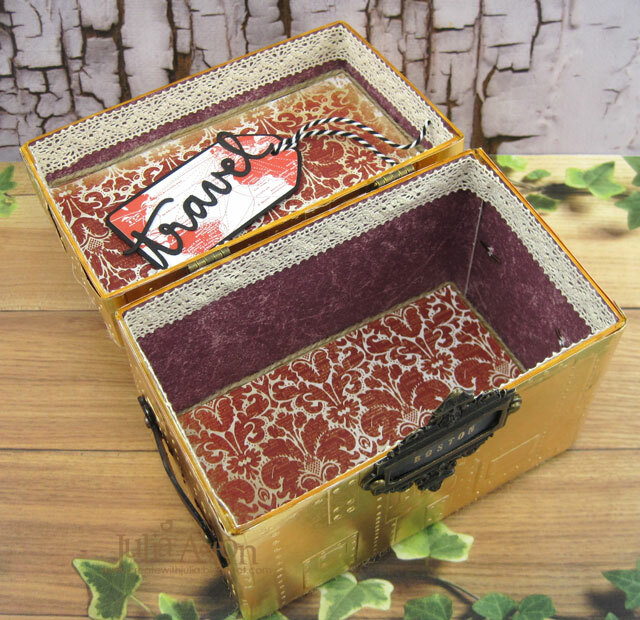 I made a travel trunk for my first project using these versatile new die. 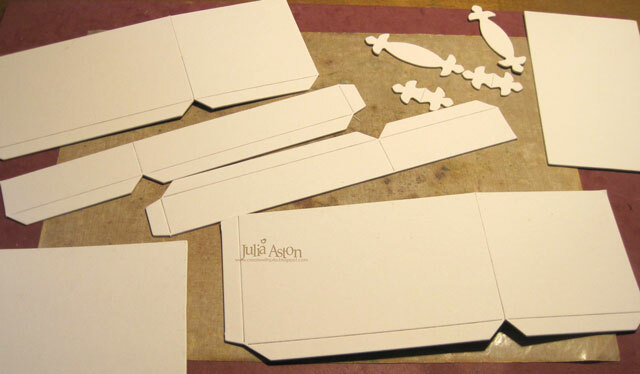 First all the pieces needed were die cut out of matboard. I measured and cut panels of Kraft Metallic Paper to wrap around the box and the cover, and embossed them using Tim Holtz 3D Texture Fade Foundry Embossing Folder - spritzing the paper with water before embossing to obtain a good deep impression. Then I adhered all the panels to the box sides, bottom and cover. I colored the die cut handle pieces with a black Tombow Marker. 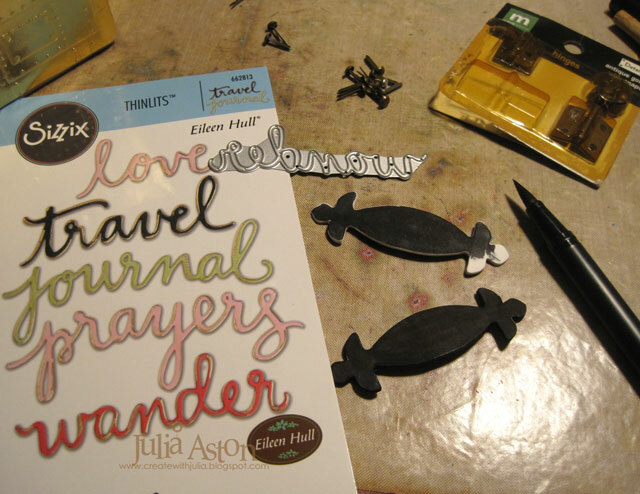 I die cut 'wander' for the cover and 'travel' for inside the cover, (seen further below), from Eileens Journaling words set. I curled the handle pieces a little bit over my finger so they wouldn't lay flat against the box. 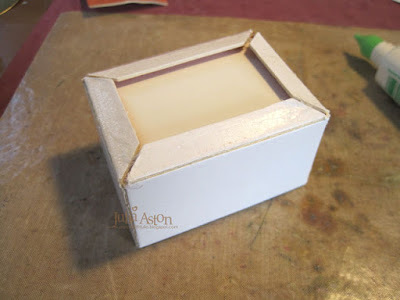 I pierced a hole on the ends of both handles and on the sides of the box where I wanted the handles and attached them with long brads. 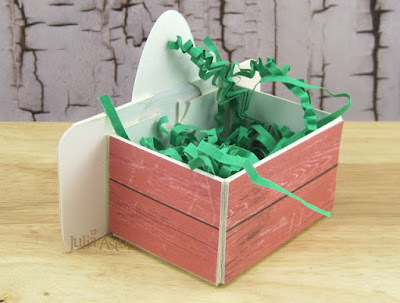 To finish off the edge along the top of the cover and bottom of the box, I ran glue along the edges and pressed jute string into the area. The photo below shows the cover edge. I decided to add some lace along the top edge of the box and cover. 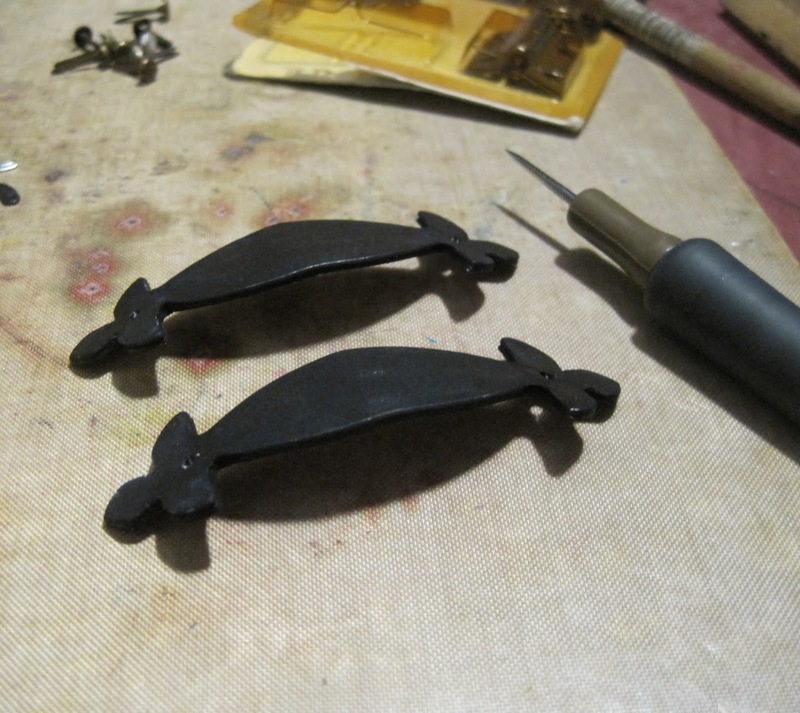 I added metal hinges that I had in my stash rather than using the matboard die cut ones. 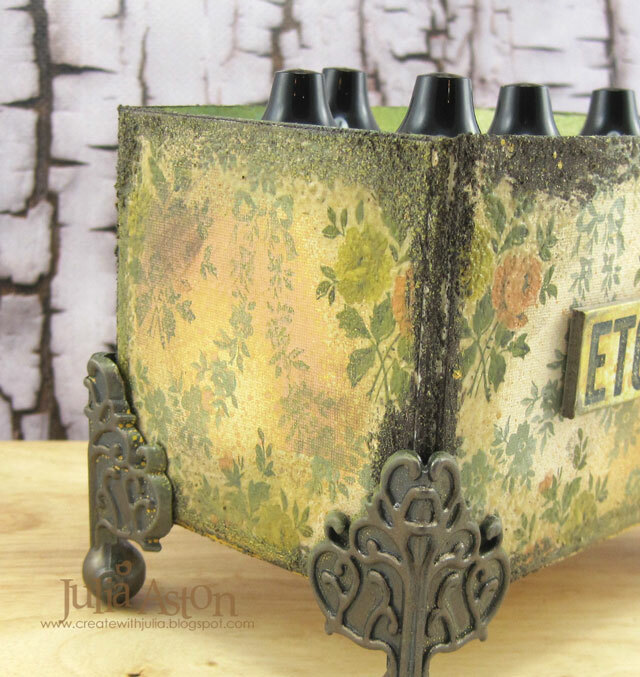 I attached a handle on each side of the 'trunk'. 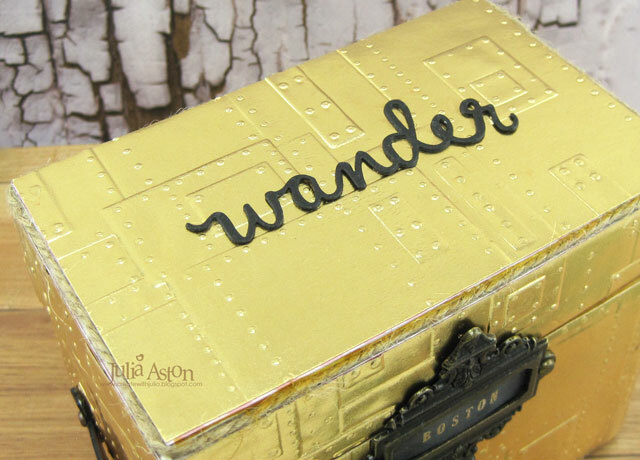 I die cut 'wander' and 'travel' out of Black Paper Leather using Eileen's Journaling Words dies. 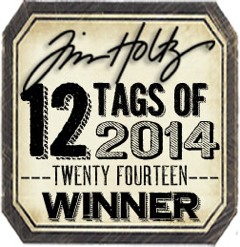 The tag was cut with Eileen's Credit Card Sleeves and Tag dies. My finished Treasure Box disguised as a Travel Trunk! Please check out Eileen's blog all of January for more inspiration from Eileen's Inspiration Team using these fun new dies! 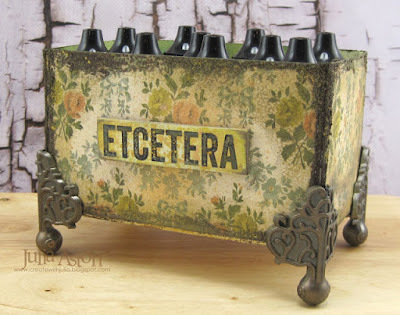 Paper: Matboard, Black Leather Paper - Sizzix, Kraft Metallic Paper, Paperstash Tidings and Etcetera - Tim Holtz/Idea-ology, True Black - PapertreyInk. 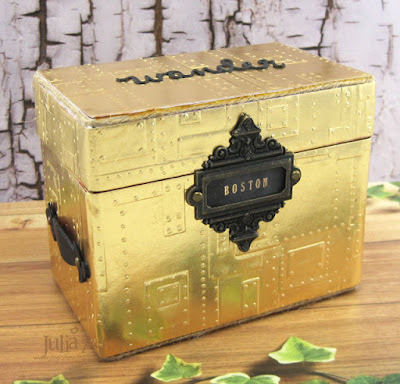 Accessories: Treasure Box Die, Journal Words, Credit Card Sleeves and Tag - Eileen Hull/Sizzix, 3D Texture Fade Foundry Embossing Folder - Tim Holtz/Sizzix, hinges - Making Memories, Long Fasteners, Ornate Plates, Jute String - Idea-ology, Black Tobow Marker, Pale Sepia Copic YR24, Gold Embossing Powder - Ranger, water mister, Victoria Lace - SU, Tombow Glue, ScorTape, black/white Bakers Twine, foam dots.